If you’re like me, you really enjoyed Virus, the visceral 2005 offering from death metal legends Hypocrisy. Then again, if you’re like me, you also have a slightly curved spine and can’t burp. OK, odds are no one reading this is completely like me, but if you did enjoy Virus as much as I did, the follow up will easily satisfy. In fact, after a few listens, I would have to say it’s even better than its predecessor. What I enjoy the most about Virus is the delicate balance between brutal and melodic that it carries so well. The riffing and vocals are ferocious enough to stand with most brutal death metal, but there is enough melody in the leads and overall result to make it highly memorable. For me, this is how melodic death metal is meant to sound. 2009’s A Taste of Extreme Divinity follows this blueprint to the letter. Peter Tagtgren’s vocals sound as maniacal and powerful as ever, cementing his place as one of my favorite death metal vocalists. One nuance that you will notice on this album though, is Peter’s more prevalent use of his higher-pitched vocal, kind of a cross between a squeal and a growl. Hear the sustained wail at the end of the chorus of the opening track Valley of the Damned for a good example. This song is the definition of a “tone setter”, pummeling you with an immensely heavy charge that sounds strangely grand with the melodious leads throughout. Tagtgren’s lower register is still fully intact though, as the next track Hang Him High shows off his guttural growl that sounds just as powerful. I venture to say there aren’t many death metal vocalists who can growl that low while still managing that much power and volume. Overall, the sound is very familiar. 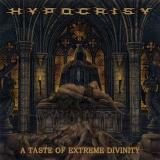 That familiarity can be a bit of an issue, as there really isn’t much here that a Hypocrisy fan hasn’t heard before. Then again, I subscribe to the “if it ain’t broke, don’t fix it” theory with music, so this isn’t much of an obstacle. There are subtle little differences here and there though, such as the constantly morphing Taste the Extreme Divine. The pace is all over the place, seamlessly switching from furious blast beats to a slower, pounding pace. This is a good time to mention that the drumming of Horgh is outstanding, and makes these abrupt changes sound flawless. Almost every song maintains the fast and brutal atmosphere, save for The Quest which is slow throughout allowing the leads to…uhh…take the lead (apologies for the atrocious pun). Whether or not you will like A Taste of Extreme Divinity will really boil to whether or not you liked the direction of Virus. In reality, this album is simply an expansion on that sound, with better results in my opinion. Sure, Peter and the guys don’t take many chances and at times the sound here tends to appear a bit recycled, but I will still be coming back for more. In the landscape of melodic death metal that is filled with scores of cookie-cutter, forgettable acts, Hypocrisy stands out with their fiercely brutal, yet charmingly accessible sound.